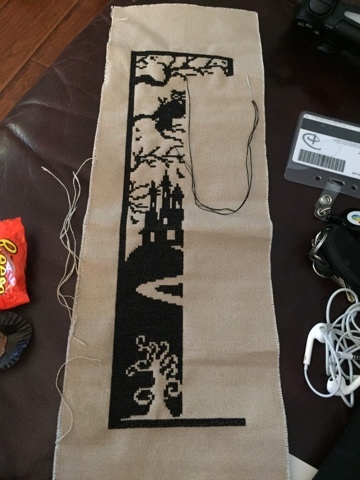 Fantasy Cross Stitch: Happy Halloween Blog Hop! Happy Halloween everyone! This post is part of the blog hop sponsored by Jo at Serendipitous Stitching. If you want to participate head over there and go to each blog to spell out the mystery phrase. Then email it to Jo for a chance to be in the drawing. And your letter is in the pic above ;). Hint: it's on the stitching. If you can't figure it out I'll post it at the bottom as well. So head on over there and say hi to Noni. I hung up my other banners finally and got them finished finished :). I did them as bell pulls. I cut the dowels and painted them an oil rubbed bronze color. Then I added some twine as the hanging mechanism. I love how they turned out. Carving pumpkins is my favorite part of Halloween. Thanks for stopping by! Have a happy Halloween! Oh yes, another Halloween blog hop letter. Now I have collected four of them. Your Halloween banners look fantastic. Fantastic progress on your stitching.The banners looks amazing! Well done on the great pumpkin carving. Great Stitching and that Pumpkin is amazing!! thanks for being part of the hop. Your banners are great! And your pumpkin looks amazing. Love carving pumpkins....I always toast the seeds too! Love your Halloween banners! and your pumpkin is fantastic! Happy Halloween. Happy Halloween! Your banners look brilliant displayed like that. 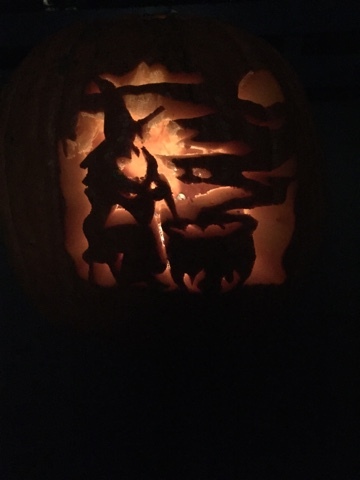 I am in awe of your pumpkin carving skills! Your banners are really lovely! And what a fantastic pumpkin too! Great stitching, love your banners. You banners are great and what a well carved pumpkin. Thanks for taking part in the Blog Hop this year. Your banners look awesome, looking forward to seeing the green one finished too. The pumpkin is wonderful carved. Visiting you from the blog hop! Nice to meet you! 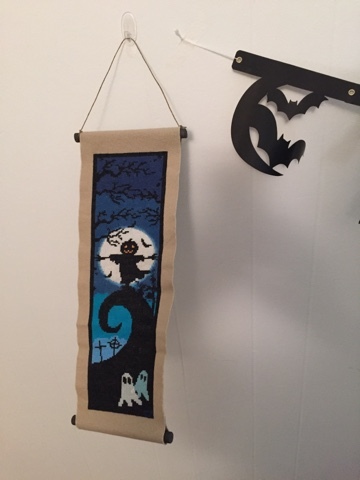 Love your banners, especially the one you are stitching - it's really spooky! Lovely banners and beautiful pumpkin, you sure are ready for Halloween! I love black and white stitching but the ones with black and colour are even better!AriadnefromGreece! Beautiful banners. They must have taken so long to stitch. I usually make smaller ones but really admire the beautiful larger pieces. 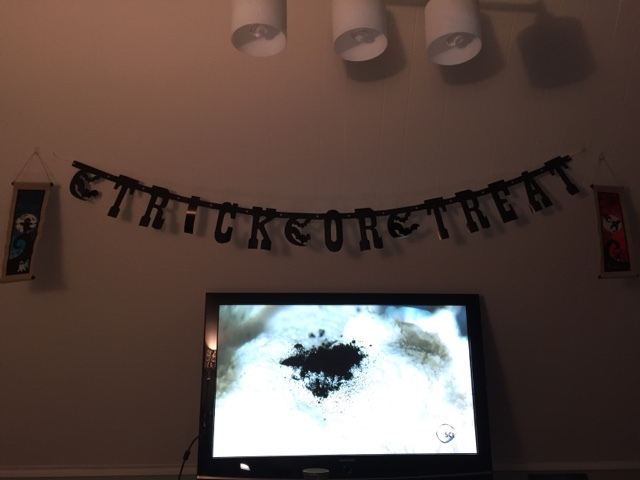 I love your Halloween banners - they look amazing! Love how the banners look! Hiya Heather I'm hopping by on the Halloween hop. What a Halloween filled post. Love all your banners. I need to learn to make a wall hanging like that. Love them! They look perfect done that way. 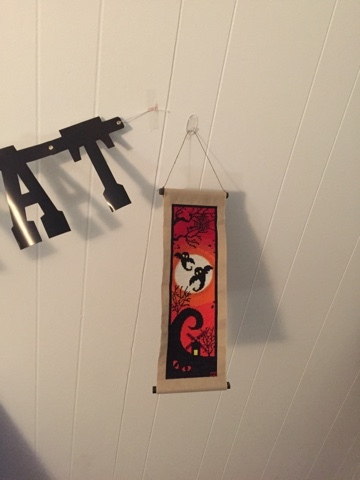 Must add those Halloween banners design to my stash wish list, they really look fantastic!! !